In the subconscient, things move mechanically forging an unconscious harmony. The electrons know that they have to rotate in their orbits, the hydrogen molecule always combines with oxygen in a pre-determined harmony to produce water and the ant knows how to build an ant-hill. Thus, there is a ‘mute premonition’(Ibid) that works out a limited harmony within fixed circles but that falls short of the ideal of perfect integration sought by the Deity within the human being. Therefore it is in the superconscient ‘that we must seek for the reconciling power and knowledge’ (Ibid) in the broadest possible terms. (b)	An universalisation of the individual being. The principle and power of perfection has its origin in the Supreme creative consciousness –the Supramental Consciousness. 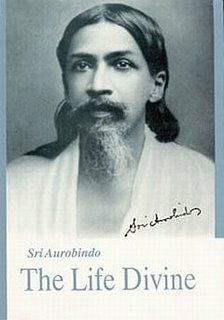 One has to begin the ascent to the top through ‘love, mental illumination and the vital urge to possession and self-giving’ (Ibid), but one has to transcend them to achieve ‘the supramental realisation of conscious unity with the One and with all in our being and in all its members’ (Ibid) so that humanity can have its salvation and its perfect integral harmony. The fourth status of Life is the ascent towards the supramental unity.